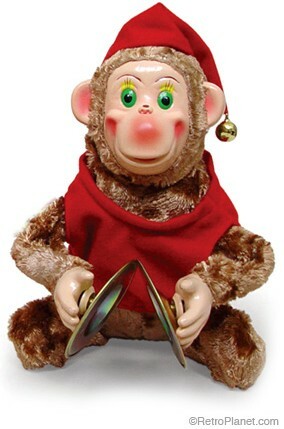 This Magic Cymbal Monkey Toy is a remake of an old classic. Battery operated, he clangs his cymbals as he hops around and chirps. Many different cymbal monkeys have been made since the 1950s. The original – called the Musical Jolly Chimp – was made by Japanese company Daishin C.K. during the ’50s, ’60s and ’70s. The chimp screeched and showed its teeth. In the ’60s various companies were producing versions of the musical monkey, usually changing his outfit and name, but keeping similar characteristics. Some say the cymbal-clapping monkey symbolizes emptiness (in the head), but retro fans appreciate him for his playfulness and say he brings back great memories. Today he’s often given to kids, adults who remember him well, and in Secret Santa exchanges.